Our iGUIDE audit is a check-up we created to make sure our clients are getting value from our services and are using our photos, tours and floor plans to their maximum potential. This final part of the iGUIDE audit is about checking our client’s use of social media, specifically their Facebook pages. A recent study by HubSpot found that 76% of adults are using Facebook on a daily basis. There’s no arguing that Facebook is a powerful digital marketing tool so it’s important to find out if your clients are using social media, how they’re using it and if they’re using it to promote their listings – your work. The importance of a well-executed Facebook property marketing program is it can help your clients funnel traffic back to their websites, to their listings generate new buyer leads, new potential seller leads, all the while increasing the likelihood of them being found during organic online searches. To start the audit of our client social media, track down their business or personal Facebook pages. When you find them we give the page a like and a follow. Check their page for property posts specifically to see if a post has been created for the property that you worked on. If you see a property post give it a thumbs up as well, then go through it following the links to make sure they work. If the post features your work, share it on your page and tag the agent thanking them for the opportunity to work. This is self-promotion, good for your brand. At iGUIDE we follow a system for creating and checking feature property posts on Facebook which we call our property post guide. It follows a basic formula for communicating effectively, extracting maximum exposure from a single post and expanding that single post into a full property marketing campaign on Facebook. Using this basic guideline we look for ways to offer our clients tips for adding compelling visuals, direct content, backlinks and tags that will expand the reach of their posts and drive more traffic back to their listings and their websites. If during an audit I find my client has a Facebook page but didn’t create a post for the property, I’ll create one for the listing that I worked on and I’ll tag them so they see what I’ve done on their behalf. This showcases my services and commitment to their business. If your clients are Facebook users, feature property posts are a way for them to showcase your listings and highlight the property marketing program. These posts will show their current sellers the efforts they take to market their home and compel future sellers to use them when they’re ready to sell. Checking on your client’s use of social media is an important part of making sure they see value from your services. Sharing your findings with them is also a great way to demonstrate your commitment to their success and the importance you place on their business. Check below for a link to our property post guide for you to start using today. 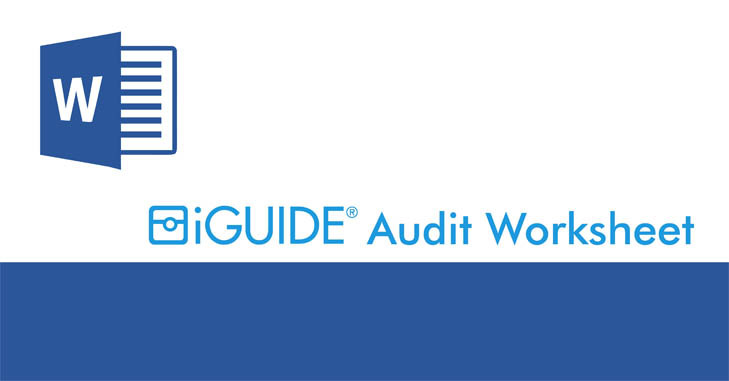 This is the iGUIDE Audit worksheet. This is what we use when we work with new iGUIDE pros to research their markets and build a roadmap for their success.